Timber decking on the upper terrace creates a direct contact with nature. 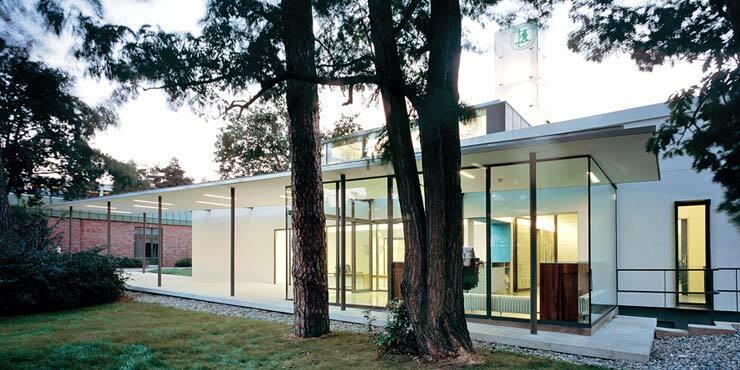 The building lies at the heart of a pine forest that the architects have incorporated effectively into their design. Storey-height windows and toplight hinges allow plentiful daylight into the rooms, channelling the view towards the natural surroundings. The operating theatres feature touch-free and therefore particularly hygienic, stainless steel GROHE Europlus E faucets controlled by infra-red technology.